The most enjoyable part of watching sports for me is the food. 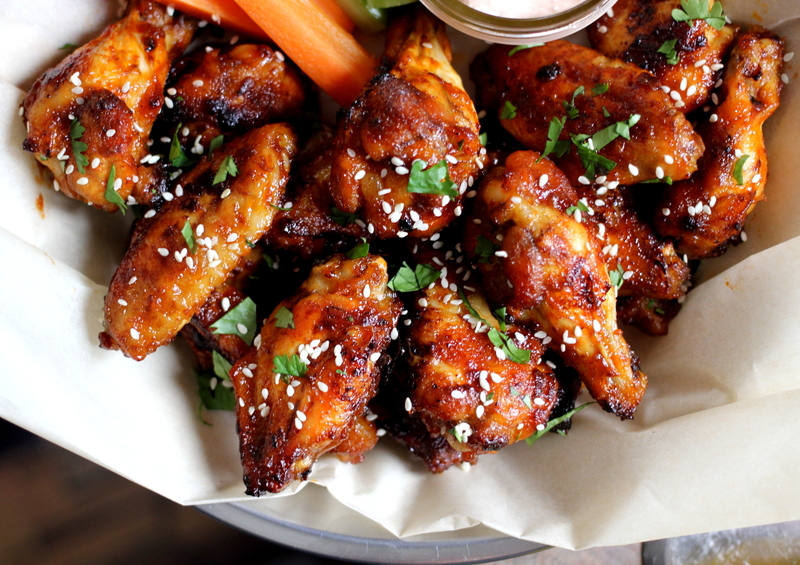 One of my favourite game day dishes is chicken wings. They are one of those party foods that you can make in large quantities and with very little effort involved. 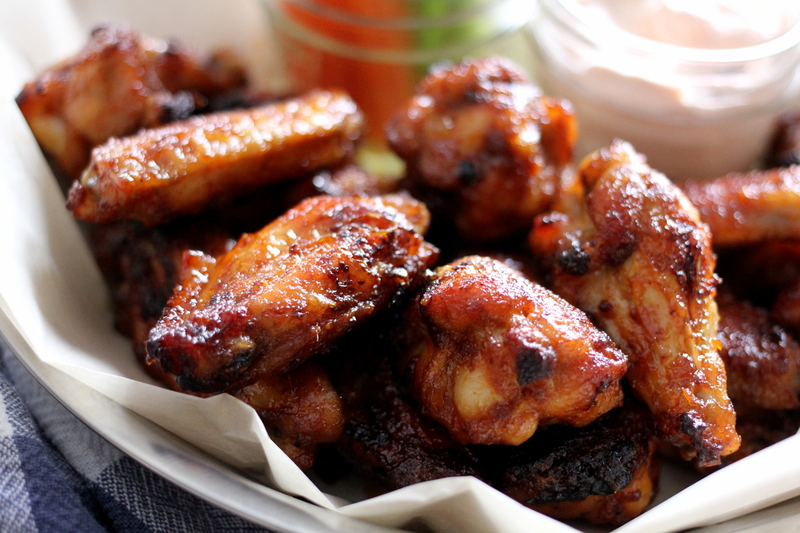 Traditionally, chicken wings are deep-fried to get a crunchy skin. 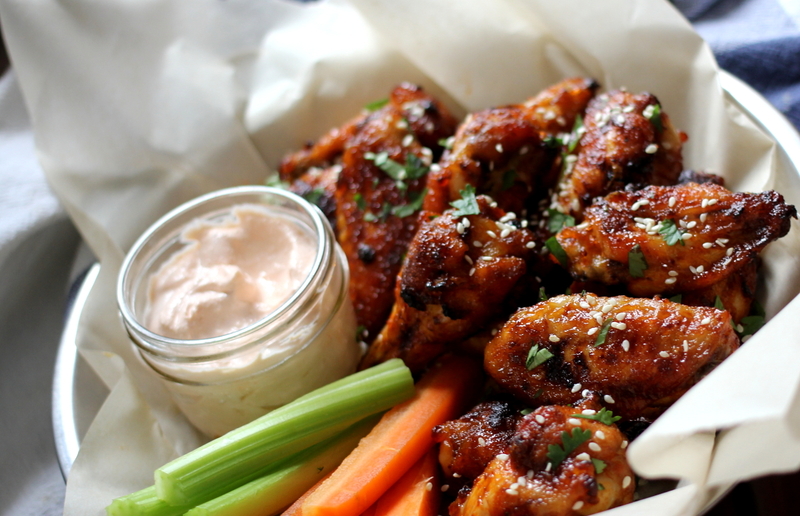 Here is a way to make crispy and saucy wings but without all of that oil. 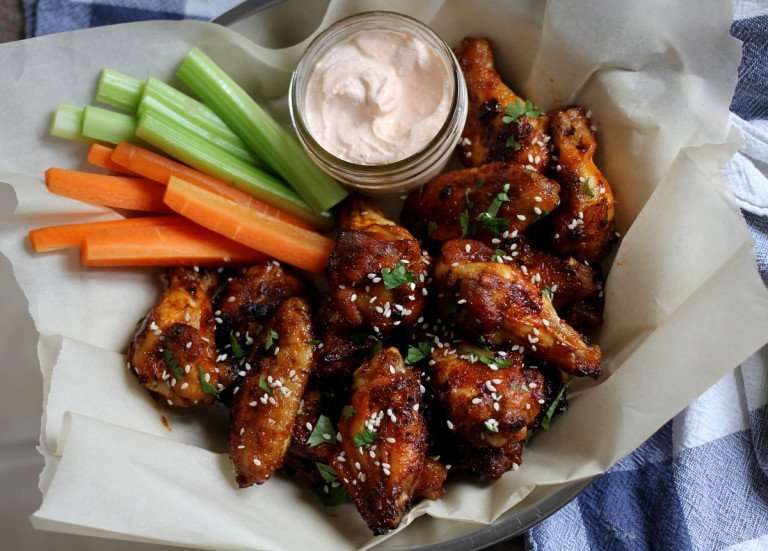 In this recipe, the wings are baked and then broiled for a short time with a sweet and spicy sauce. 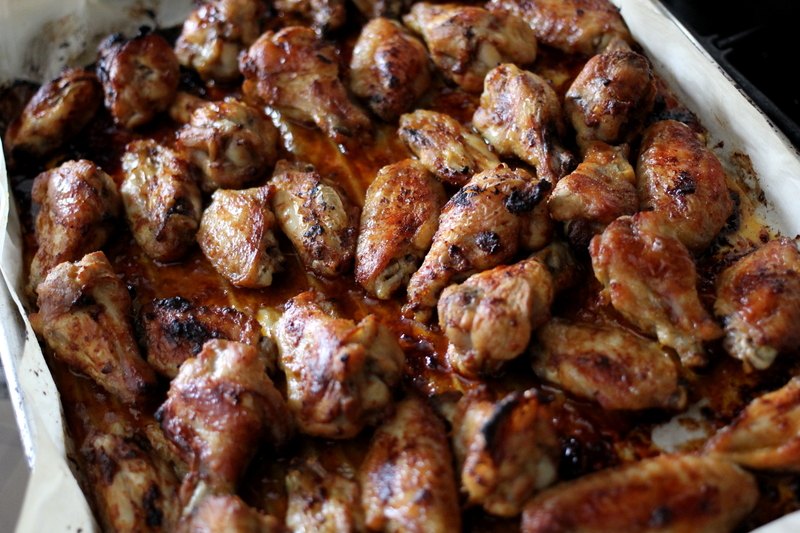 For this recipe, I have used LiberTerre chicken wings. LiberTerre chicken is raised without the use of antibiotics and hormones and are also grain fed and raised in Canada. Their chicken is also air-chilled which keeps the meat tender and juicy when cooked and preserves the natural great flavour of the chicken. If you have a lot to prepare for game day, there is a little cheat you can use that will make this recipe even easier. The night before, create the rub and coat the wings. In a separate container, prepare the sauce. Cover and refrigerate both bowls overnight. On game day, simply bake then broil your wings according to the recipe below and you’ve eliminated any game day prep involved so you won’t miss out on any awesome plays! If you don’t like spice, reduce or eliminate the cayenne pepper and Sriracha sauce from the recipe. 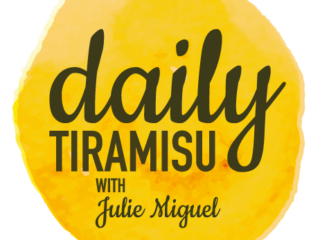 I’ve also made sure this recipe is really easy to make so that even the most reluctant home cooks and sports fans can get a touchdown in the kitchen! Enjoy! Preheat oven to 400 degrees Fahrenheit. Line a baking sheet with parchment paper. 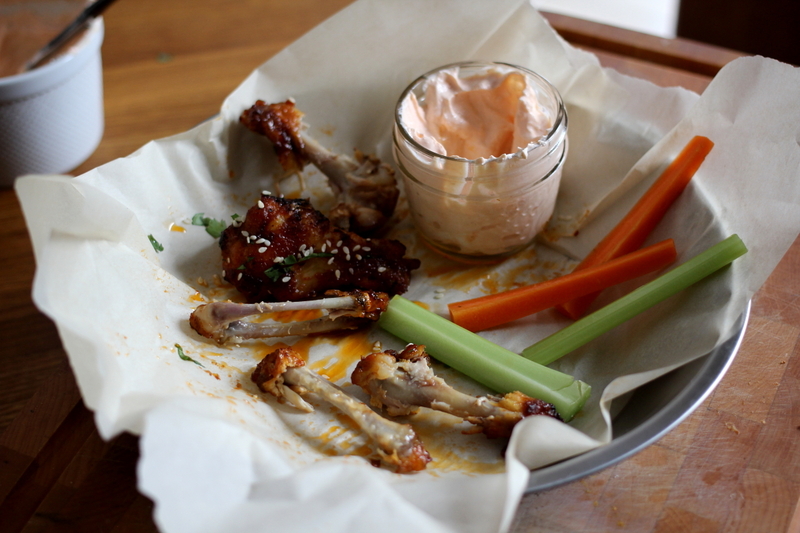 Put chicken wings in a large bowl and set aside. 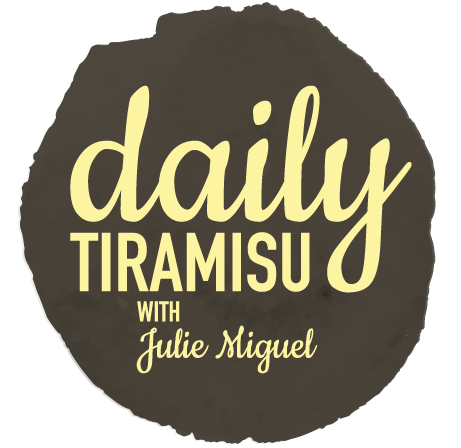 Make the rub: In a large bowl, combine all the rub ingredients together. Pour the rub over the chicken wings and using your hands, toss to coat. 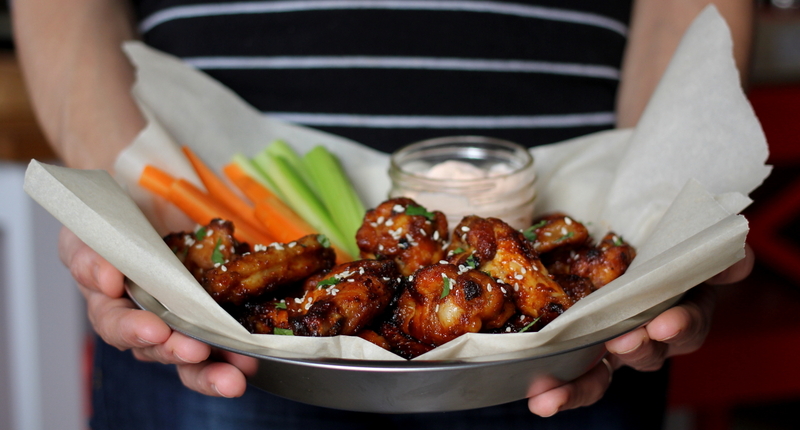 Place the wings in a single layer on the parchment lined baking sheet. Place the tray on the middle rack of the oven and Bake for 50-55 minutes or until the chicken is cooked through and the skin appears brown and crispy. Make the sauce: Melt the butter in a small pot over medium high heat. Add all ingredients to the pot except for the corn starch and whisk to combine. Bring the sauce to a boil and cook for about 1 minute, stirring constantly. Whisk in the cornstarch just until thickened (about 30 seconds). Remove from the heat and set aside. Once the wings are cooked through, carefully remove the tray from the oven and set the oven to broil. 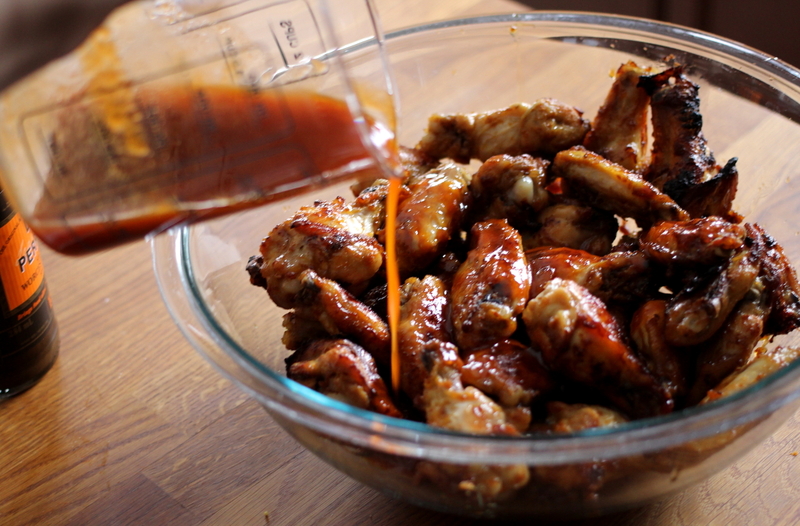 Using tongs, put wings into a bowl and pour over the prepared sauce. Toss to coat. Carefully pour out any extra liquid from the baking tray and using tongs, put the coated wings back on to the tray being sure they are not crowding each other. Use a heat safe kitchen brush to paint on some extra sauce (do not dump all of the extra sauce over wings because this may prevent them from browning and crisping). Place the tray back on to the middle rack and broil for about 4-5 minutes or until the wings have a coloured crispy skin (be sure to keep watch because the broiler can burn the wings very quickly). 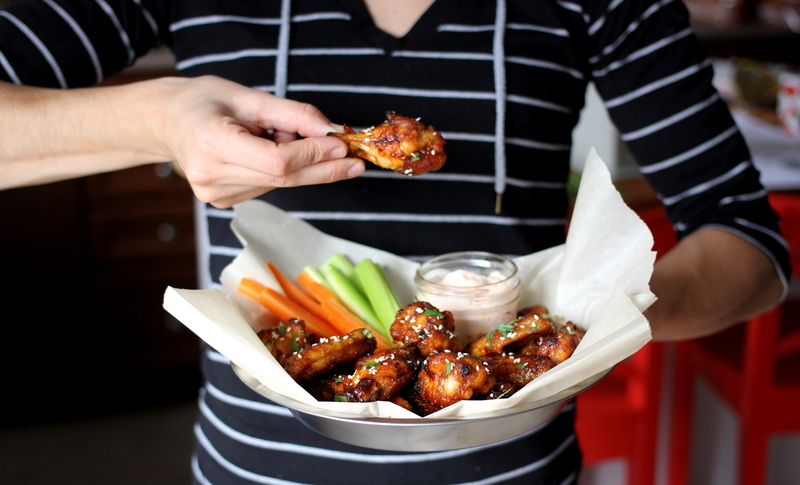 Remove the baked wings from the oven and place them on a serving platter. Sprinkle with sesame seeds, cilantro and lime wedges. Serve hot with the sriracha sour cream on the side. 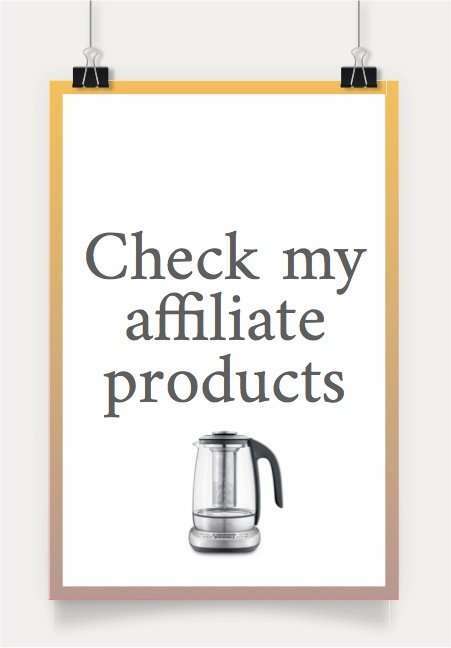 *The above recipe and post was created as part of a paid partnership between LiberTerre and myself. However, and as always, all opinions are my own.